There's joy in listening to a great tune but nothing beats the experience of singing it for real. 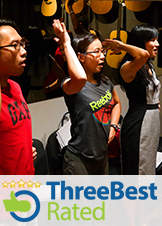 Awaken your vocal ability as we unlock your potential to sing beautifully through our breakthrough classroom approach. Come believing and experience the impossible. The XPerience module is a short 3-week trial class designed for the complete novice to experience and embrace music from within. Be exposed to the wonders of our Voice and awaken the power of singing in your life. It was through a company promotion that I came to know about Believer Music. I had always thought about learning to sing. I felt singing is one of the best ways to express yourself but I never had the courage to sign up for singing lessons as I thought singing lessons are expensive and out of reach for common people like me (there must be some basic talent to even start learning!). I could not be more wrong when I came to know of Believer Music. Everyone was so friendly, approachable and professional at Believer Music. They truly help you believe in yourself, that you can learn to sing....WELL! There are so many techniques and skills to learn to sing properly and as long as you are willing to try and learn, you can do anything and unleash the true power of your own voice! i) interested in exploring how to sing with the proper techniques. iii) who do not possess prior understanding of the fundamental workings of the voice. iv) who do not possess practical knowledge and efficient techniques of breathing with diaphragmatic muscle control. i) discovered and experienced essential vocal exercises that will form a lasting foundation for further music education. ii) experienced the wonder of proper singing with a variety of techniques and know if it suits you. iii) sung to favourite contemporary pop songs. Sadly, "tone deafness" has become a stigmatizing label and has locked many into a fear of releasing their voices. In fact, genuinely "tone deaf" cases are rare. Most, who claim they are tone deaf, really aren't. Often, not being able to pitch has to do with not hearing a pitch carefully before physically singing it. Some experience difficulty in pitching due to the strain of notes on the extreme ranges. The XP Trial Vocal Program adopts an approach which helps students address these issues. I have never seen myself as a singer. Are you sure I will succeed in this course?